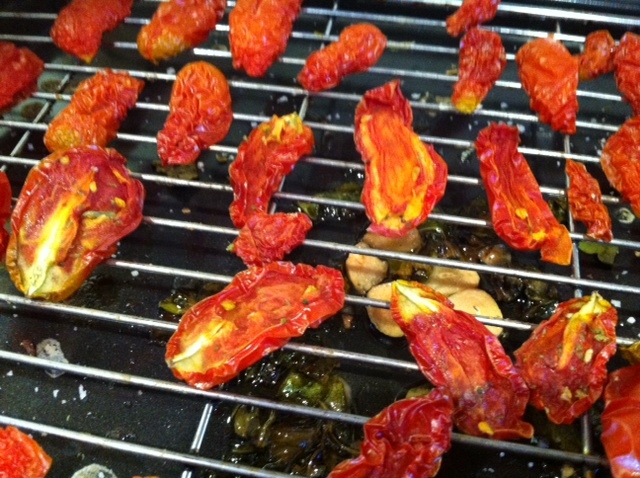 Oven dried tomatoes, one thing to do with your glut. The tomatoes in my garden are remaining resolutely green and as hard as bullets. I can’t say I blame them, they have no greenhouse to retreat to when the weather is miserable. I have three plants, one plum, one tumbler and one black Russian, a beefsteak variety. Buying my plants from a gardening club stall at a local fair allows me to choose an unusual variety or two, that are new to me, each year. The sungold I bought was eaten by something before it could establish itself sadly. Fortunately I have a solution to my tomato drought. 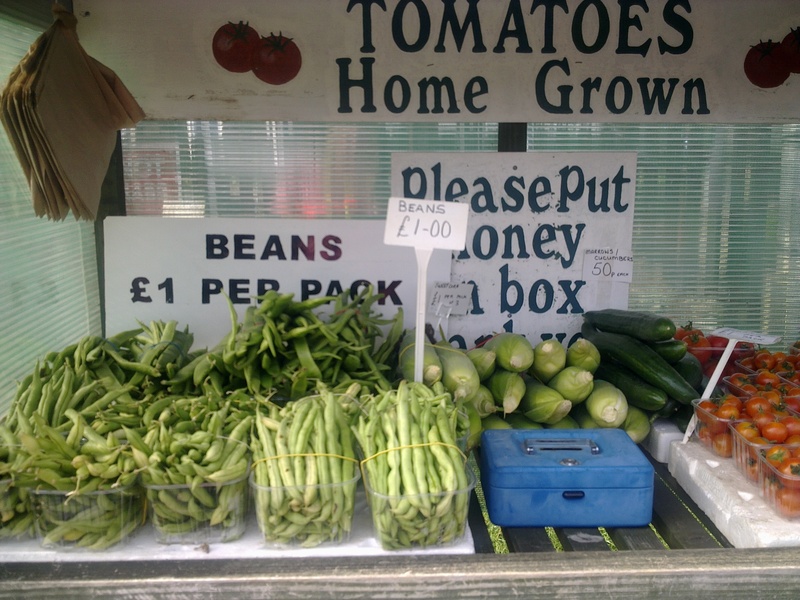 Despite living right on the London / Surrey borders I do have access to farm shops, pick your own fields and a wonderful produce stall complete with an honesty box. I look forward to seeing the stall sitting on the roadside. It begins the year filled with a mix of tomato varieties, runner beans and green beans, then come the sweet corn, and finally the squashes and pumpkins. 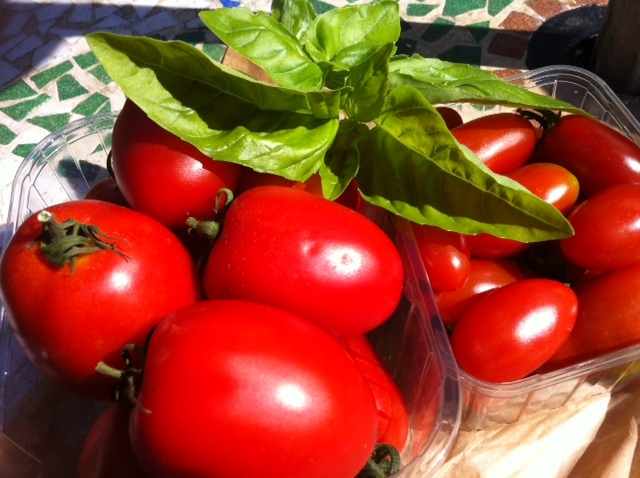 This morning I passed the stall and picked up two punnets of bright red plum tomatoes, some large and some baby but all beautiful. At FBC5 I had tasted some of the most delicious sun dried tomatoes, perhaps I could use these tomatoes to make an oven dried version, for both snacking on and cooking with. Using more than a little trial and error I set about having a go. A good quantity of tomatoes to make it worth your while putting the oven on! Place the cooling rack onto the baking tray. Halve the tomatoes and remove as many seeds as possible. Sprinkle the cut surfaces with salt. Lay the tomato halves onto the rack cut side down. Allow to drain for about 30 minutes. 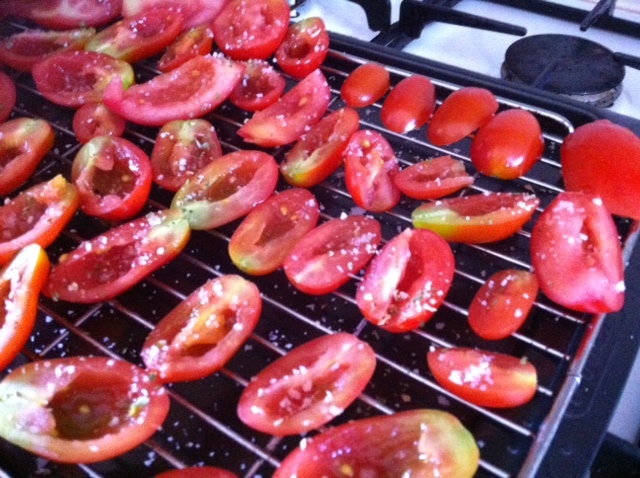 Pop the basil and the garlic onto the tray with a splash of olive oil to perfume the tomatoes. Place the tray into the oven for 3 hours. Check the tomatoes on the hour and turn over. If the tomatoes are small they may need less that 3 hours to become semi dry. If they are larger slightly longer. When dried to your liking allow to cool and put into the Kilner jar. Use within a few weeks, keep in the fridge. I’m adding this to the July 2014 Cooking with herbs link up organised by Karen at Lavender and Lovage. The challenge was to use basil in a recipe and this fits the bill nicely. Do you have anything like this near where you live? 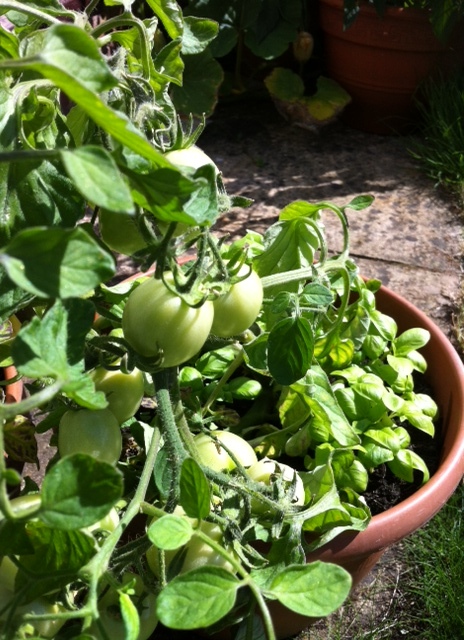 I have plenty of Jamie Oliver posh type green tomatoes in the garden. TWO are red. I’m taking this as a positive sign and I am so pleased you posted this recipe because I am definitely going to try it! I’ve also lots of chillies ripening too. Might pop the odd one in as well! Ill let you know how I get on! Such a GREAT idea and I often make my own too! 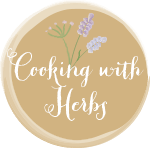 Thanks for linking up to cooking with herbs this month!